5793 labyrinths found. Showing 601-620. Sorted by country, state, city, then zip/postal code. Labyrinth of feelings and compassion. It represents the Moon. Sun labyrinth. It represents power. 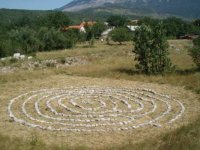 This is a portable Labyrinth which is set up all over Croatia. This Labyrinth is set up at different times and in different places depending on the need or the invitation. 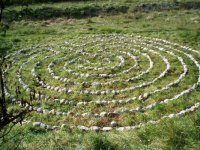 You can find out when and where the Labyrinth will be set up by visiting our web page. 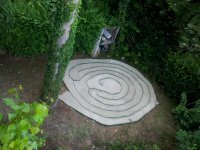 Or if you wish to have us come and set up the Labyrinth you can contact us regarding arrangements. 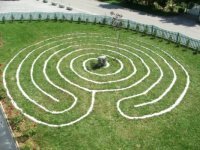 This labyrinth is a contemporary version of a cathedral labyrinth which combines ancient Christian tradition with modern music, meditations, art, media and activities at intervals along the path. It is available in Croatian and English language. Jonny Baker and the team from London. Croatian version adapted by YFC Croatia/MZK. Center for NeoCulture is located in upper Medjimurje, on the border between Croatia and Slovenia, amongst forest and fields. Nearest place is the small village of Badlican, reached from the city of Varazdin or Cakovec (Croatia) in the direction of Ormoz or Maribor (Slovenia). If you come from the Croatian side, before you reach the border, turn right for Sveti Urban (if you come from Slovenian side, after you cross the border, turn left for Sveti Urban), drive to Macinec, turn left for Badlican. In Badlican turn right for Gornja Dubrava. Drive 200 meters more, on the small hill, before the forest, there is our Center. There are nine labyrinths in the "City of Labyrinths" (labyrinths of power, feelings, energy, conectedness, wisdom, love and creativity, life and death, transformation and freedom - according to the book by Adrian P. Kezele: Labyrinths and their secrets). 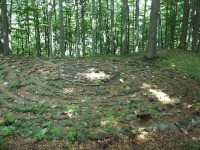 Labyrinths are located imediately near Center for NeoCulture, in a natural forest park, owned by Art of Giving association. Labyrinths are made of stones, from 13-20 meters in diameter each. The entrance is marked by two big wooden tables with description of the project and the map of the whole forest park. 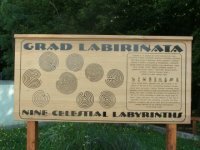 Written on the sign next to the Labyrinth: "The Zagreb Labyrinth or the Labyrinth of Resurrection and Seven Planets is a cosmogramme modeled after the Minoan labyrinth of the ancient Cretan culture. 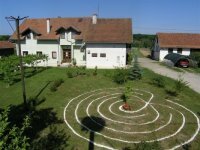 It stimulates the environment and harmonizes ongoing transformation of energies of the planet, and is the first of the kind in Croatia. 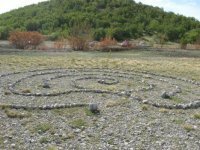 The history of a labyrinth as a form dates back over 4000 years. All traditions considered its magical geometrical appearance sacred. It symbolizes a spiritual path - the entrance represents purification, discharge and release, the center is the place of light, clarity and insight, and the exit symbolizes unity, initiative, integration and external action. The author is Johannes Mathiessen, a German architect and a Waldorf pedagogue, realized by Center Sirion, Zagreb. June 21, 2003 R.S.C. Jarun"
Island may be closed for public during some events like open air concerts and festivals. Owned by City of Zagreb (Zagreb Holding). 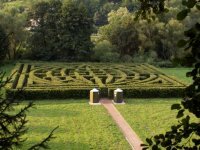 at Cyherbia park there is a hedge maze (2000 sq.m.) and a lavender labyrinth for meditation. Guided meditations are available. The labyrinth is located at my home. Please call before coming. The mosaic is in situ, at the Kato Pafos Archaeological Site, just to the west of the town centre, entrance next to the harbour. Subject to current opening hours - check website for current details. 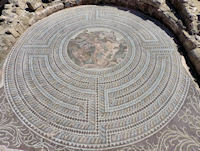 The mosaic is part of a much larger mosaic floor, in situ, located at the Kato Pafos Archaeological Site, just west of the town centre, entrance adjacent to the harbour. Subject to the standard opening hours of the museum - visit website for current details. Due for completion June 2016. 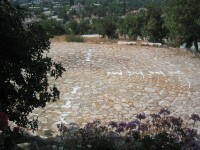 Labyrinth located in Paraka Park, Chloraka, Pafos, Cyprus. Between Azia beach hotel and Laura beach hotel. See our Facebook page. Complex of Three Labyrinth: Noosphere Resonator. Center: Chartres Labyrinth - Grail - on left: Classic Seven-turn labyrinth with right spin. on right: Classic Seven-turn labyrinth with left spin. Situated at the Trout Farm in Bela. May and September, weekends only, from 9am to 5pm - June, July and August, every day from 9am to 5pm. 49 59' 52"° Lat. ; 16 17' 25"° Long.